Today I headed across the state to Miami-Dade County to look for exotics. 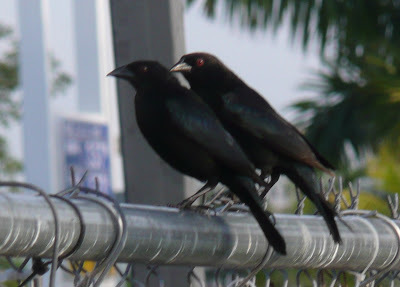 First stop was in a restaurant parking lot in Miami to look for Bronzed Cowbirds. Though not exotic they are an expanding, invasive species. Found a flock of about fifteen of the cowbirds, plus other invasive/exotic species in European Starlings, House Sparrows, Eurasian Collared Doves and a lone Common Myna. 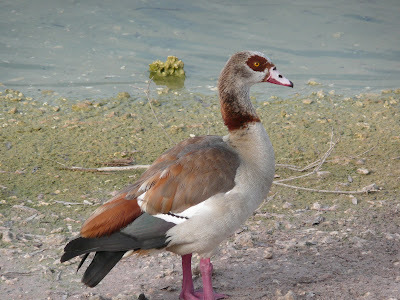 On the campus of the hospital I got better looks at the the Mitred parakeets as well as Anhingas, Ring-billed Gulls, various domesticated waterfowl including Muscovy Ducks and another exotic in an Egyptian Goose. The Egyptians are slowly expanding in Florida, preferring sights like golf courses and parks, with short grasses and ponds. I first saw this species on the golf course next to my Mom's condo in Pembroke Pines a few years ago. is a small flock of blue and yellow macaws that are found in the Coral Gables/University of Miami area. 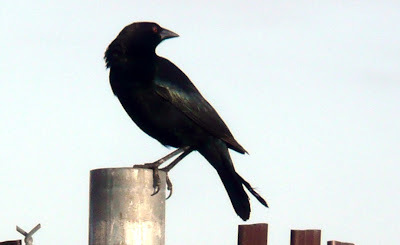 A week earlier I was lucky to have spotted another Florida specialty and nemesis bird in a Smooth-billed Ani. I had returned to Glades County near LaBelle to look for Crested Caracara and Florida Scrub Jays, and on my way home had an ani fly across Rt 80 a couple of miles west of LaBelle. I have made several attempts at locating this bird at reported locations in Ft Lauderdale and the Everglades the past few years. Now I have one unexpectedly cross my path. Cool!! The smooth-billed ani is common bird in the Caribbean and South America and was once common in south Florida, but is now disappearing. Started the month off with a birding blitz on the first. Started the morning with waiting at a Red-cockaded Woodpeckers cluster at dawn for the awakening of the endangered woodpeckers, at Babcock-Webb. Aside from the seeing the RCW was also lucky to find a Bachman's Sparrow, and several Brown-headed Nuthatches. Could also add a Great Horned Owl, Northern Flicker, Eastern Bluebird, Sandhill Crane, Eastern Towhee, Northern Bobwhites, Pine Warblers, Yellow-rumped Warblers and Tree Swallows. From Babcock-Webb I made stops in Alva for hits on American Kestrel and Red-headed Woodpecker, then a visit with the White's to view activity at their feeders. These feeders were very busy with American Goldfinches, Painted Buntings and Indigo Buntings. Also present were a Chipping Sparrow, White-winged Doves, Mourning Doves, Northern Cardinal and a calling Northern Parula. Next onto Lehigh Acres and Harn's Marsh. Was able to assist some newby birders in locating Snail Kites and Limpkins. Also present were the usual wading birds - Great Blue Heron, Great Egret, Tricolored Heron, Green Heron, Glossy Ibis, White Ibis, Little Blue Herons, Snowy Egrets and Cattle Egrets. The duck and coot numbers seemed to be decreasing. Seen were Mottled Ducks, Lesser Scaups and Blue-winged Teal, plus American Coots and Pied-billed Grebes. Can also add Wilson's Snipe, Tree Swallows, Bald Eagle, Osprey, Red-shouldered Hawk, Anhings, Fish Crows, American Robins and Savannah Sparrows.